An obstacle on the Devil's Highway. It slowed us down but didn't stop us! 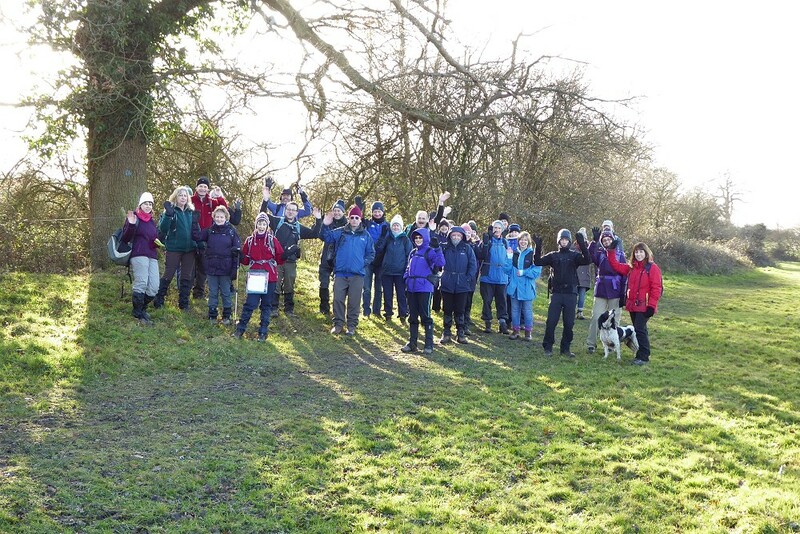 The first Sunday of 2018 saw thirty people turn up at Beech Hill for a short (6 mile) walk, which for some of us, would be followed by a pub lunch. Although not a record for our group, thirty is a pretty big turn-out. Perhaps this was the result of some people's New Year's resolutions? We started off heading more-or-less south from Beech Hill until we joined the Devil's Highway. Following this dead-straight Roman road, we came across an obstacle. A large tree, covered with a substantial creeper, had fallen across the path. Probably a result of the recent Storm Eleanor. It took a bit of time for all thirty of us to climb over it. Stopping for a snack-break on the way to Stratfield Mortimer. The Devil's Highway soon turned from a track into a lane, which we followed briefly before heading north on a footpath that crossed the railway on a steel bridge. Turning right, we joined one of the many Berkshire Circular Routes, which appear on Ordnance Survey maps of the area. I have yet to find anyone who knows the origin of these routes. We stopped for a snack-break. Flasks were opened and coffee cups steamed in the cold air. Some people had brought mince pies, left-over from Christmas. This would keep us sustained until the end of the walk as, unusually, there would be no picnic lunch-stop today. Instead, lunch would be at the pub! 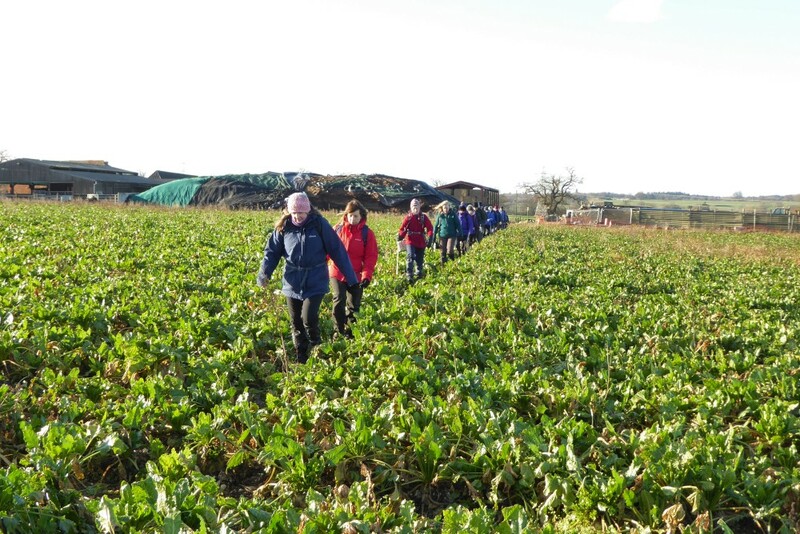 Making our way through sugar beet (or are they turnips?) at Great Park Farm. 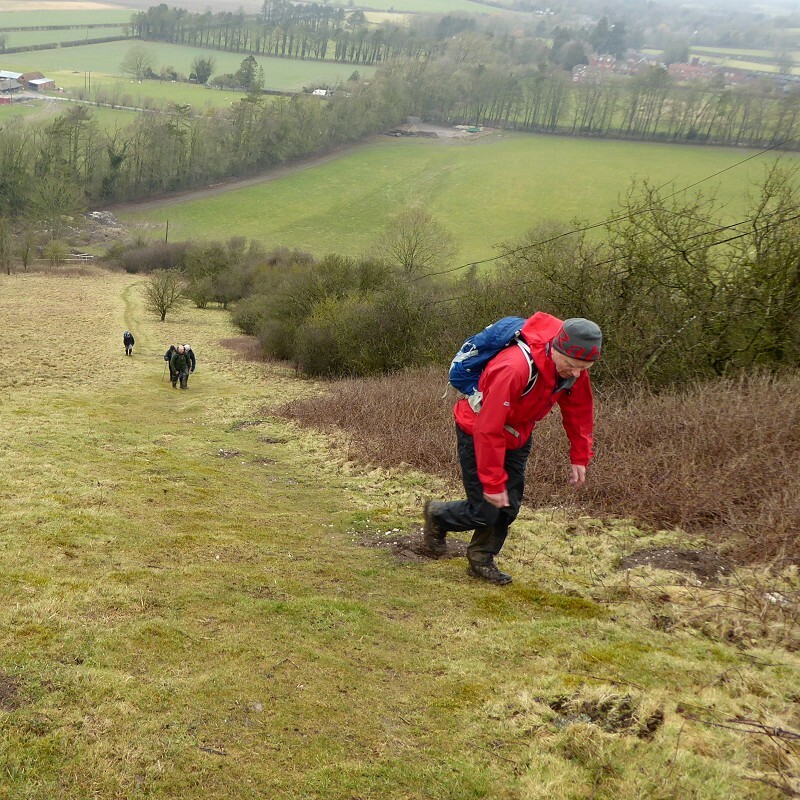 Continuing on our Berkshire Circular Route, we headed up to Stratfield Mortimer, where we left it for the road. 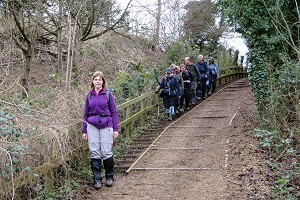 After some careful walking along the road, we joined another footpath that crossed the railway and headed into Great Park Farm. Weaving our way through the cattle sheds, we left the farm by crossing muddy fields of crops. 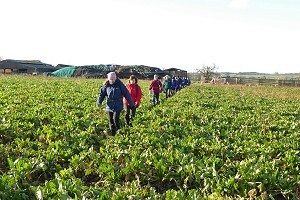 There was some debate on whether they were turnips or sugar beet plants that we were stepping between. 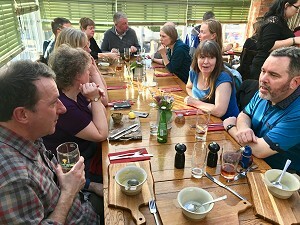 Some of us stayed for a pub lunch after the walk. We seemed to cross dozens of muddy fields, some with crops and others just mud, but it was only about five of them. Eventually we emerged between two houses on Beech Hill Road and we were back at the start. See our route on Google Maps. Thank you to Julia Coombes for providing these photographs of the walk. 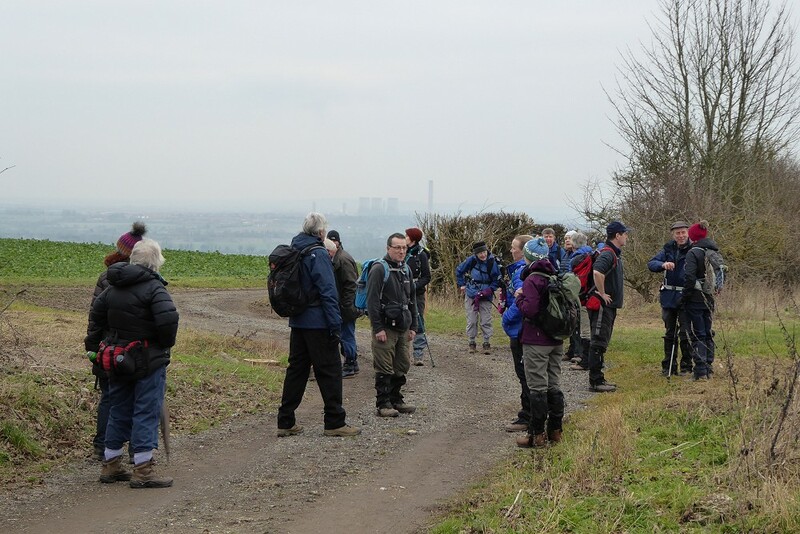 Stopping to regroup on Churn Hill, with Didcot power station in the background. On Sunday 14th January we joined the Pang Valley Ramblers for an 8½ mile walk around Didcot area of Oxfordshire. 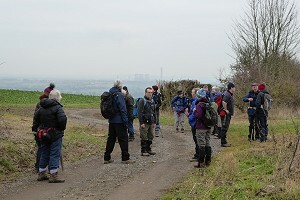 I think we had nineteen people in total, eight of which were from our group and two visitors from another group. Starting from the recreation ground car park in Blewbury, we soon warmed up on this cold day by walking up Churn Hill (about 260 feet of ascent). Stopping at the top for everyone to catch up, we took the opportunity to look around us. Didcot power station could be seen to the north and a reservoir at the summit of the hill to the west. The misty weather prevented us from seeing more of South Oxfordshire and West Berkshire. Stopping to admire the view near Upper Chance Farm. While we were stopped on Churn Hill, Michael Howes, from the Pang Valley group, told us a bit more about the area and its history, having grown up quite locally. 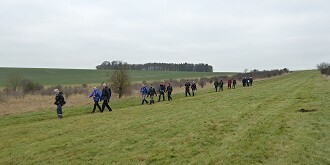 Soon we were heading downhill, past the gallops between Upper Chance Farm and Lower Chance Farm. In the distance we could see a railway bridge near Churn Farm, the track beneath it long gone as a result of Doctor Beeching's cuts. At the bottom of the hill, we joined The Ridgeway, and followed it uphill for a short distance before diverting on one of the Berkshire Circular Routes, which feature in so many of our walks. Soon we were at the foot of Lowbury Hill - the site of a Roman Temple - where we stopped for our picnic lunch. Marching down the hill near Lower Chance Farm. After lunch, we headed north, downhill and then uphill again, toward the village of Aston Tirrold. Leaving the village, heading west, we made our way past Blewburton Hill - the site of an Iron Age hill fort - back toward Blewbury. We passed along some lovely picturesque lanes through the village of Blewbury before arriving back at the recreation ground. See our route on Google Maps. We thanked the leaders, Pauline and Alastair for an excellent walk, and agreed we should do joint walks more often. 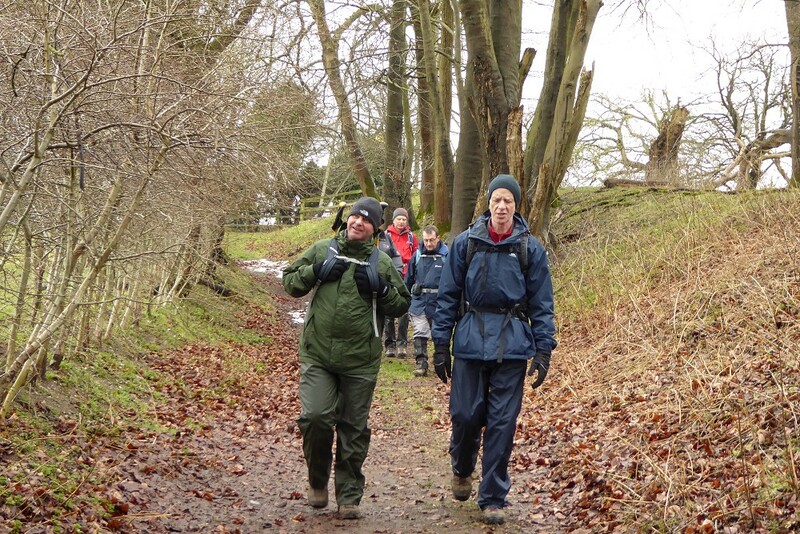 Thank you to Michael Howes and Julia Coombes for providing these photographs of the walk. Walkers and cyclists passing near the start of the route. On Saturday 20th January we tried an experiment - a joint cycle ride and walk. Not a new form of biathlon, but a choice of riding or walking, giving the cyclists in our group a chance to show off their machinery. 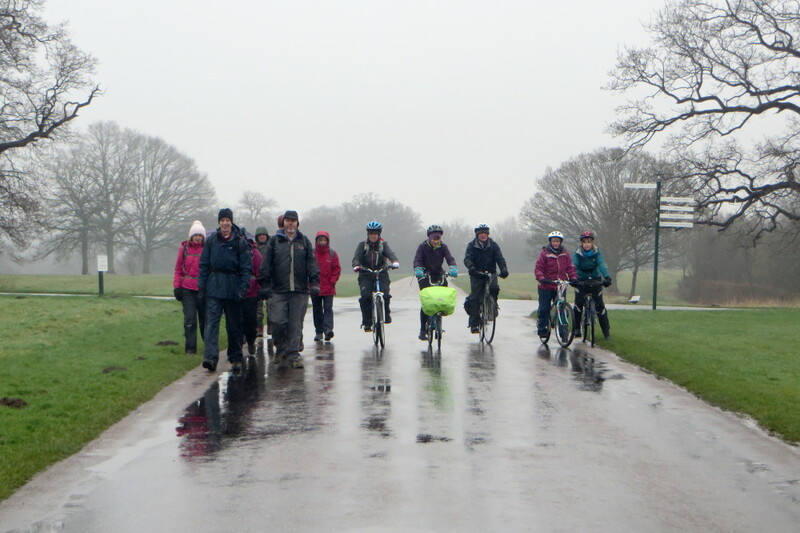 Despite the persistent rain and very low temperature, we had eleven walkers and five cyclists meeting up at the Rangers Gate car park at Windsor Great Park. 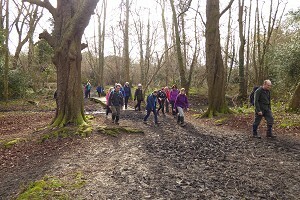 I led the walkers on a ten mile walk within the park, while Sue and Colin led the cyclists on a much longer route that included the park and the surrounding area. Stopping to admire the Totem Pole near Virginia Lake. We (the walkers) set off first as one of the cyclists was doing an emergency repair, but they soon overtook us and we didn't see them again until lunch time. 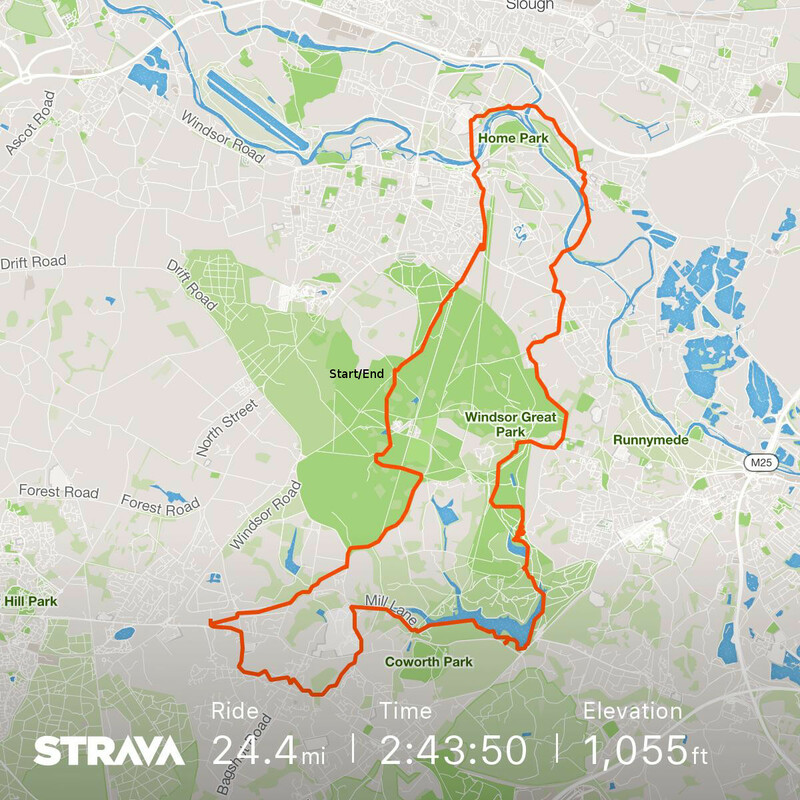 Their route passed through the park and then off to Ascot, before returning to the park by Virginia Water and stopping at the Cumberland Obelisk. 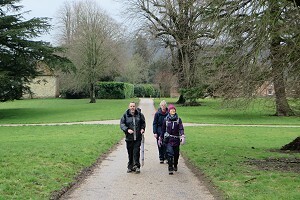 We headed south, past the Village and along Duke's Lane through the park until we reached Virginia Water. First following the southern bank of the lake, near China Island, we then crossed the bridge and walked through the heathland of Temple Bungalow. Crossing another bridge, we followed the lakeside path between the Valley Gardens and the northern bank of Virginia Lake until we reached the Canadian Totem Pole. The statue of King George III on horseback atop Snow Hill. 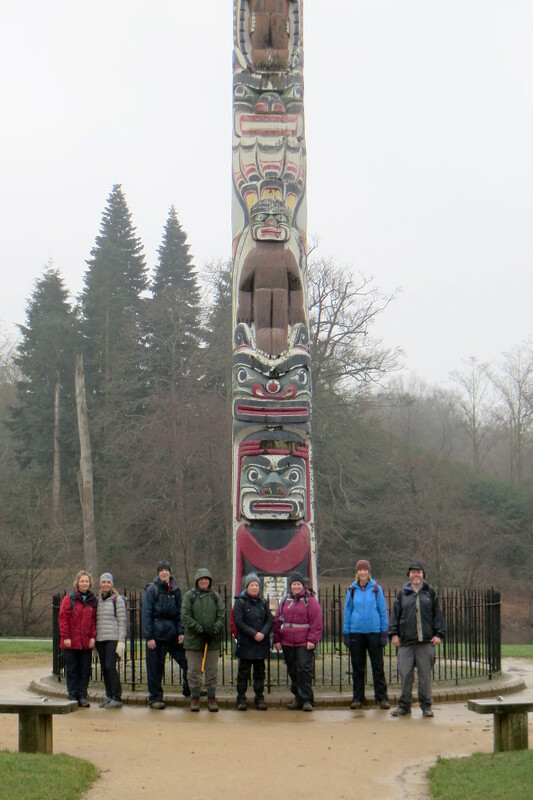 Here we stopped to take a look at this 100 foot tall carved wooden structure. Some of us had a quick snack or a coffee from a flask. Leaving the lakeside, we made our way north, through woodland and rhododendrons, to Obelisk Pond. Skirting around the pond, we reached the picnic area by the Cumberland Obelisk, where the cyclists were waiting for us. After comparing notes, we had our picnic lunches and then went our separate ways. The cyclists rode off towards Old Windsor and Eton before heading up through Windsor, past the castle. 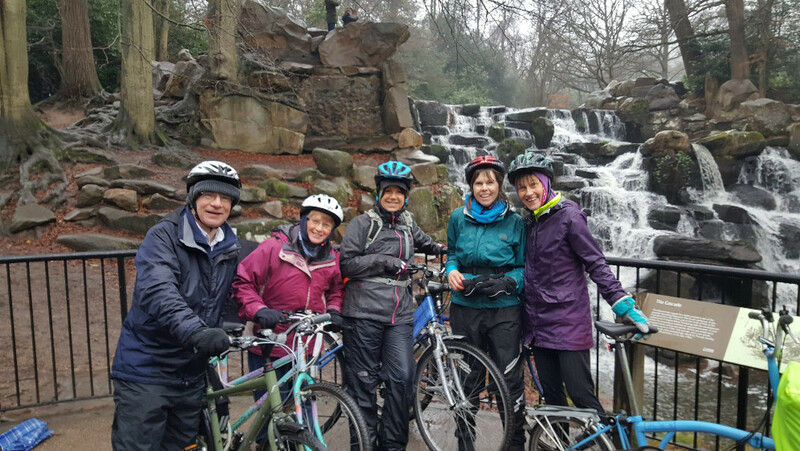 The cyclists at the waterfall by Virginia Water. We headed off toward Snow Hill and the Copper Horse statue, via Cumberland Lodge. Looking down the Long Walk from Snow Hill, we couldn't see Windsor Castle at all. The drizzly, misty weather totally obscured the view. We returned to the car park via the Village and the Ranger's Lodge. Just as we were in sight of the car park, we saw the cyclists returning. What incredible timing! 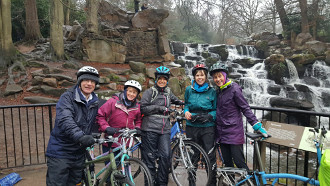 Soaking wet, but quite pleased with ourselves, we changed out of our muddy boots and waterproofs while chatting about our first joint walk and cycle ride. It seemed to have gone well, despite the weather. Perhaps we'll do another one later in the year. See our walking route and our cycle route. Lots of ups and downs in Hartslock Wood. 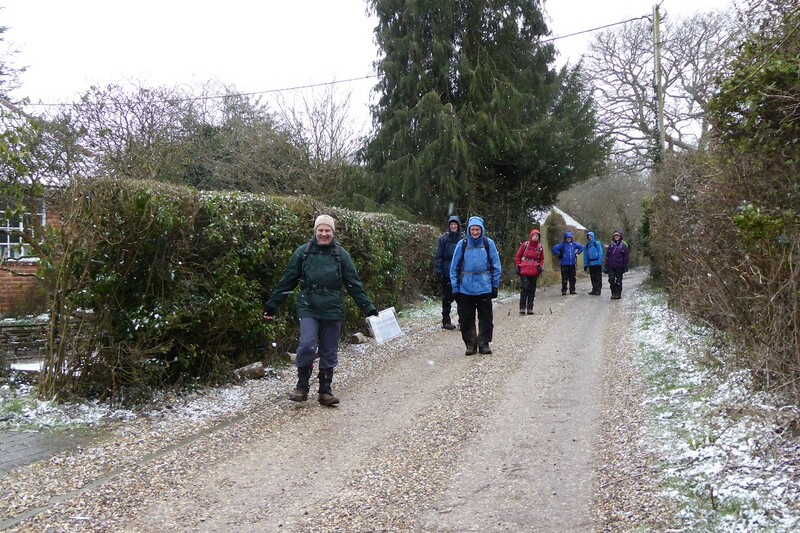 We had a good mix on Sunday 28th January - two members of the Mid Berks group, one from the West Berks group, one from the Loddon Valley group, one from the Berkshire Walkers, and four of our own group. 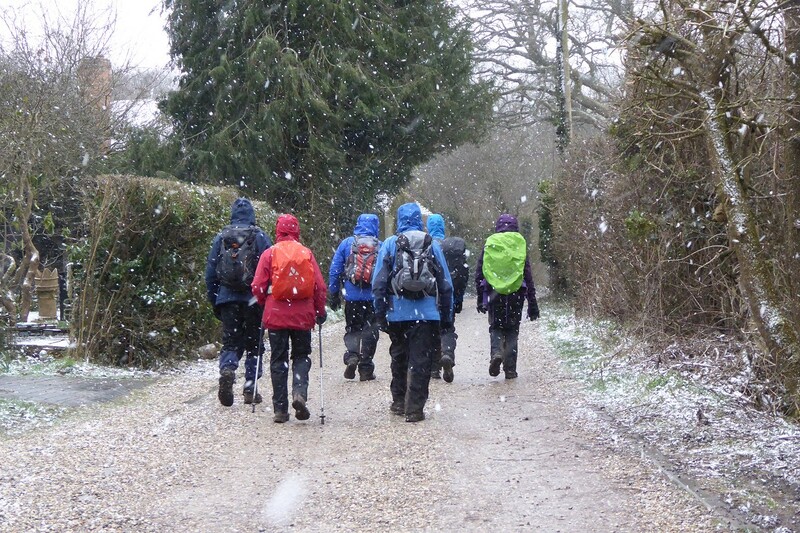 We met outside Pangbourne Village Hall, the same meeting point as the Pang Valley Ramblers, who were doing a 5 mile walk around Pangbourne College and Tidmarsh. Our walk was 9 miles, including Whitchurch-on-Thames and part of the Thames Path to Goring. We started by crossing the River Thames on Whitchurch Bridge and following the High Street up the hill before turning off onto the Hartslock Bridleway, all of this was part of the Thames Path. The Thames Path was very muddy as we approached Goring. The path now followed the Thames from high up on a steep wooded bank. Eventually the path descended to just a foot or so above the water level and became very muddy. We passed under a railway bridge and continued following the Thames Path until we reached the outskirts of Goring, where we left it to go 'in land'. Doubling back along better paths, we passed under the railway once more and through Gatehampton Manor before briefly re-joining the Thames Path going the other way. Stopping on the hump of land by Hattonhill Shaw, we ate our picnic lunches while taking in a view of the Thames (including part of the route we'd just taken). 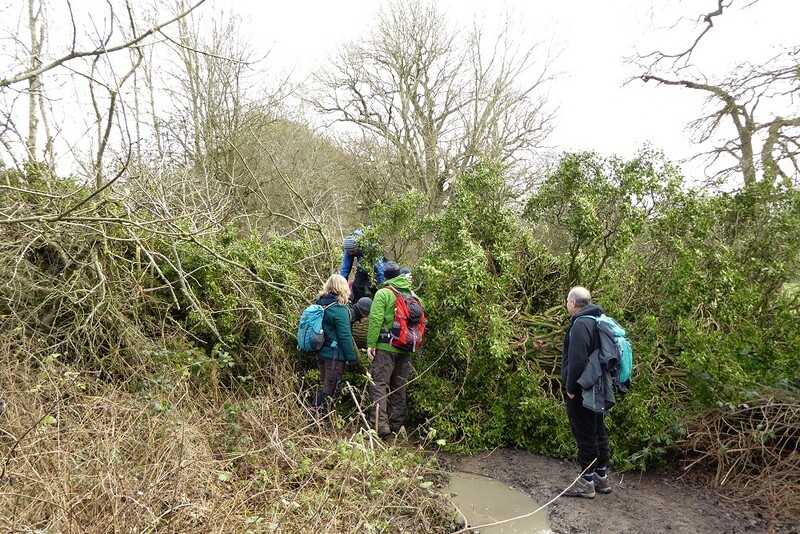 Another obstacle was this fallen fir tree near Beech Farm. Recharged, we set off on a track, which joined a road that rose steeply to Upper Gatehampton Farm, where we briefly joined the Chiltern Way as it passed upwards through Great Chalk Wood. Emerging from the wood, we followed a road up to Cold Harbour, the highest point of our walk at 400 feet above the Thames. It would be downhill from now on, through farmland and woodland. 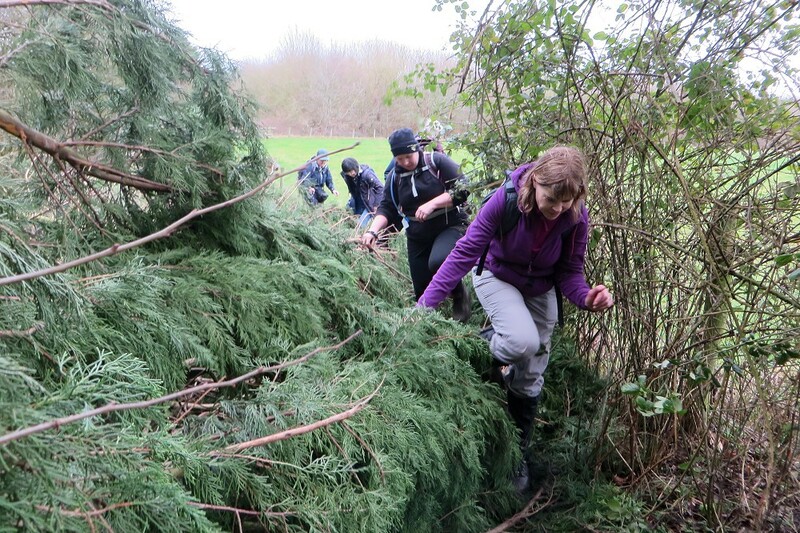 On the way, we encountered a fallen fir tree, blocking the path. 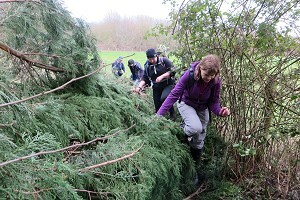 Some careful manoeuvring was needed to climb through the branches to the other side. Heading back through Whitchurch, we took a detour past the church before crossing the bridge into Pangbourne. See our route on Google Maps. After the walk, we stopped for a drink at The Cross Keys pub in Pangbourne before heading home. The River Loddon near Mill Farm. On Sunday 18th February, eighteen of us (including some visitors from other groups and a few newcomers) met up in Rotherwick for a ten-mile walk. 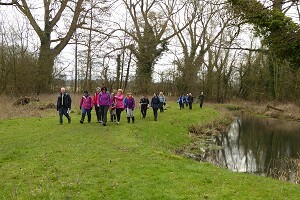 We set off by joining the Brenda Parker Way by the church and following it north-west, weaving between the River Loddon and the Lyde River, to Mill Farm. 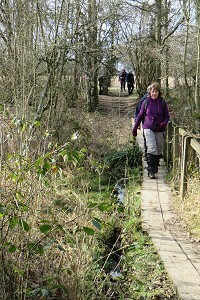 Crossing between Newnham and Hook near Owen's Farm. 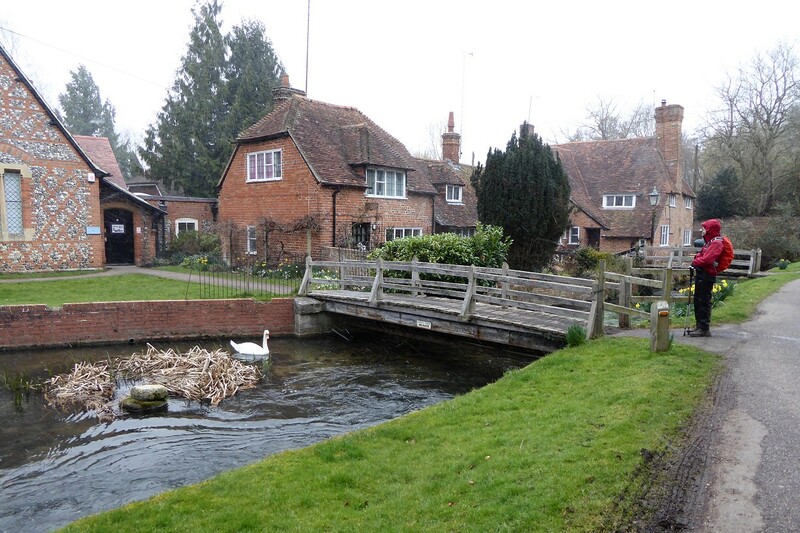 Leaving the Brenda Parker Way, we looped around and began to follow the River Loddon southward through farmland. We left the Loddon for a footpath that crossed a rather flooded field and crossed the Lyde before entering the village of Newnham. Here we stopped for a picnic lunch on the green. After lunch we left Newnham, following a footpath through Naishes Farm and Owen's Farm into the larger village of Hook. 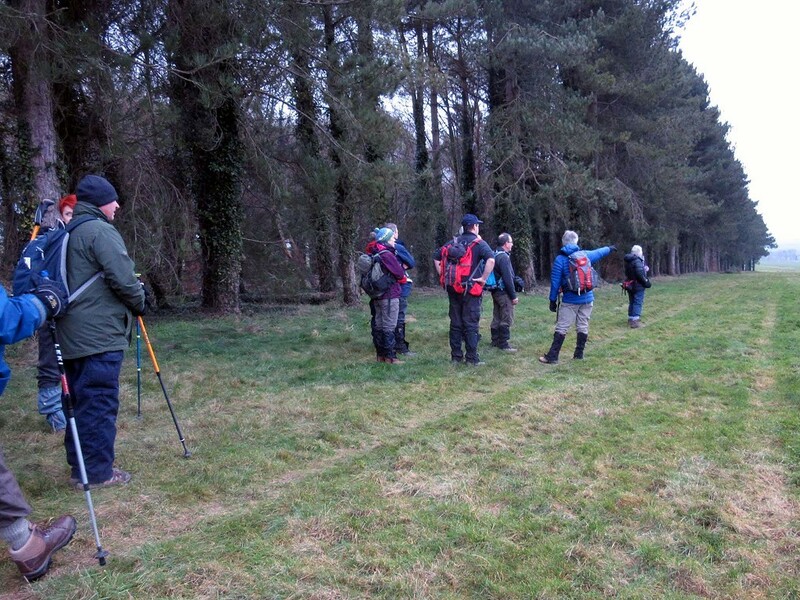 Here we followed a path around the north-west edge of the village before heading into the woods at Shirlen's Copse. Our route headed north, passing mostly through woodland, before re-joining the Brenda Parker Way at the fishing lake. Leaving the Brenda Parker Way after about half a mile, we headed north-west through Street End Copse and into Rotherwick. Following footpaths and alleyways behind the houses, we emerged behind the Village Hall, a short distance from where we had started. See our route on Google Maps. According to my GPS, we'd done about nine miles, although it felt like more due to the muddy and slippery paths we'd been on. We were able to change out of our muddy boots before paying a visit to The Coach & Horses pub for refreshment. Descending from Watership Down to Sydmonton. 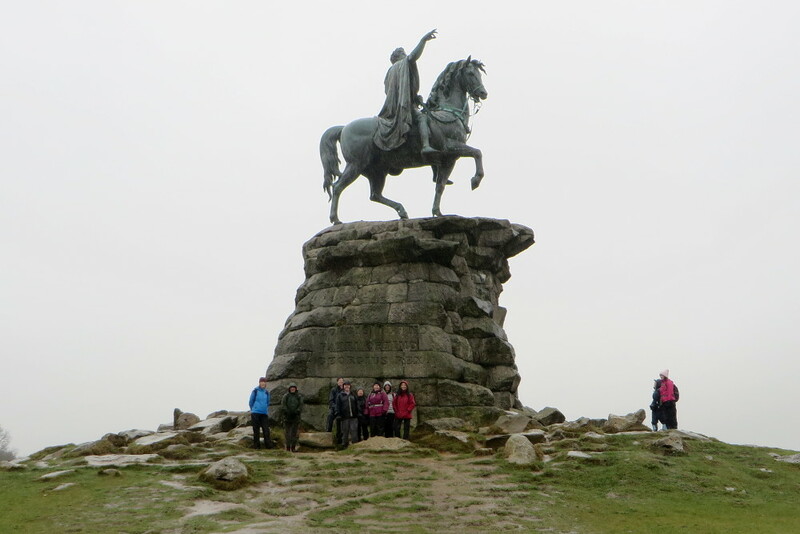 On Saturday 10th March, six of us met up on White Hill for a ten-mile walk, despite the dismal weather forecast (which as it turned out, was rather pessimistic). 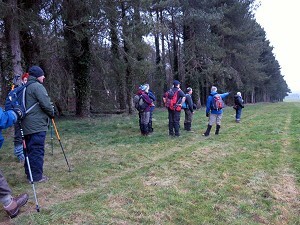 We set off along the top of Cannon Heath Down, on the Wayfarer's Walk. It wasn't exactly raining, but very low cloud. We could only see the bottom half of the TV transmitter mast at Hannington. The top was lost in mist. As we passed over the top of Watership Down, we stopped to take a look at the Richard Adams memorial tree and plaque. Richard Adams was a local lad and was working as a civil servant when he began writing in his spare time. His first novel, Watership Down, was set in the immediate area of our walk. Crossing through the Sydmonton Estate. 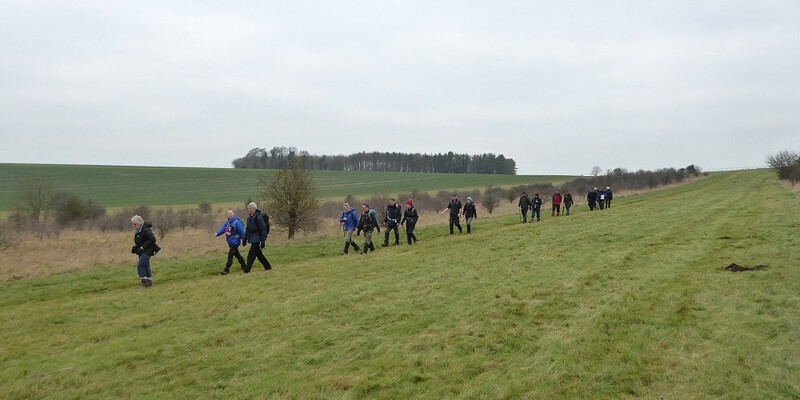 Leaving the Wayfarer's Walk at Nuthanger Down, we descended to Sydmonton, home of Lord Lloyd Webber. 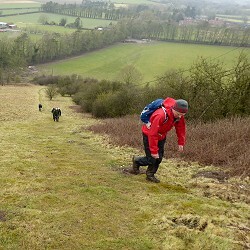 Passing through the Sydmonton Estate and Watership Farm, we took a footpath up a steep hill to Nuthanger Farm. This farm and its raised barn feature in the Watership Down book, as do a number of other landmarks we passed on this walk. At the top of the hill we were able to look back at Cannon Heath and Watership Down, where we had been earlier. 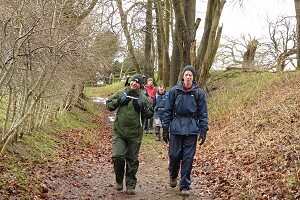 We descended toward Ecchinswell but bypassed the village and headed to Southwood Copse. Here we stopped for our picnic lunch, finding some fallen trees to sit upon. Struggling up the steep hill by Freemantle Park Down. After lunch we passed by the fishing lakes at Frobury Farm, through the open fields of Porch Farm, and into Kingsclere village. Here we stopped off for a drink at The Crown pub, opposite the church. I think there may have been a wedding at the church that day, as some people popped into the pub who were rather more smartly dressed than we were! Refreshed, we headed up through the village to the recreation ground and then back down to the gallops at the Park House Stables. Crossing these to Freemantle Park Down, we decided to ascend White Hill by a lesser used and much steeper footpath. This proved quite challenging, especially for me as my asthma was playing up that day. 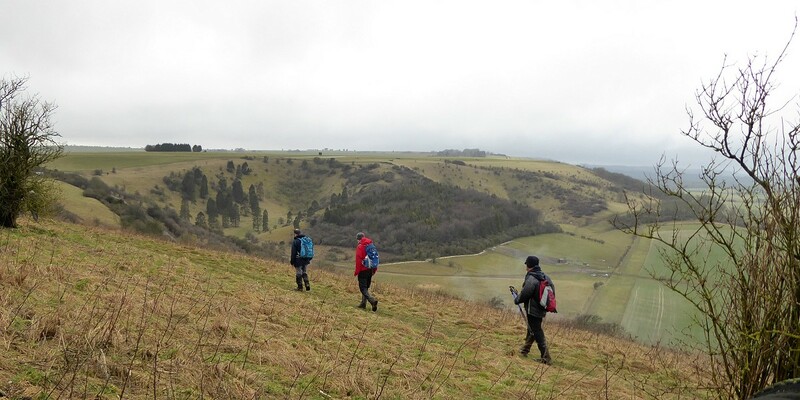 Taking in views of The Warren, Combe Hole and Watership Down. At the top of the hill, we followed a well-established footpath, that isn't on my map, which crosses over Stubbington Down to White Hill. This gave us impressive views of The Warren, Combe Hole and Watership Down (all of which we couldn't really see when we walked along the top of them that morning). See our route on Google Maps. According to my GPS, we managed a total of 510m (1,700ft) of ascent during this walk. It certainly felt like it! Footbridge over the Pang to the houses in Bradfield. Nine of us, including one member from the Pang Valley Ramblers group met outside the Bladebone Inn in Chapel Row for a seven-mile walk. The sign at the entrance to the inn is most unusual and is said to be a whale bone encased in copper from a whale that was found at the beginning of the 17th century in the Kennet valley; this might suggest that the inn sold whale oil which was used in the 19th century as oil for lamps. 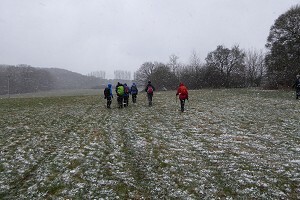 The weather forecast for the weekend predicted snow and when setting off from the Bracknell area, this was already heavy and blustery. Thankfully the conditions improved as we approached Chapel Row and the first part of the walk saw just the odd flurry. Passing Kings Copse on the way back to Chapel Row. 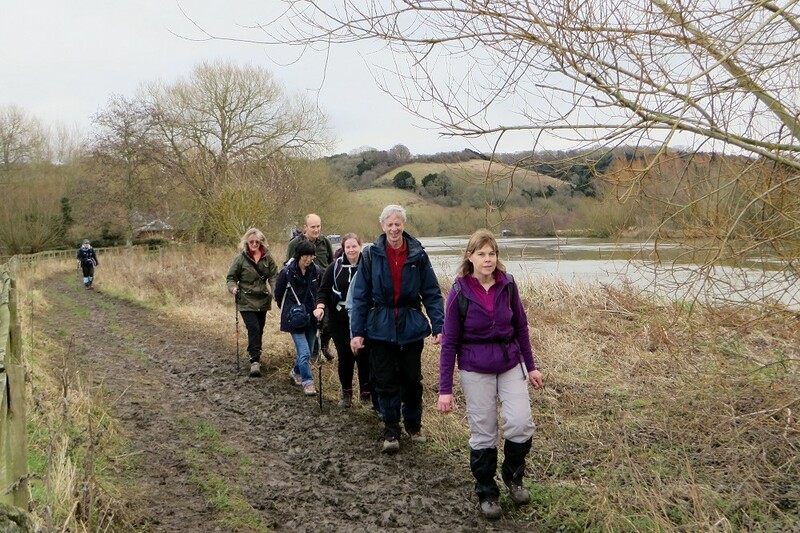 The first section of the walk took us along a very muddy bridleway and mud was soon to become a theme for the walk. We then crossed a field to Kings Copse before joining several other bridleways with lovely views over the Pang Valley. Passing woodland in which the ghost of a veiled woman is reputed to walk under the shelter of the trees, we soon arrived at a small cluster of houses known as Rotten Row. Here it was lovely to see spring flowers poking through the snow in the gardens of the pretty cottages. Returning to Chapel Row, in the snow. Leaving the hamlet, a short ascent led to a pathway between banks, creating the impression of walking through a tunnel. Continuing through fields, we soon reached the extensive grounds and golf course belonging to Bradfield College, which dominates the centre of Bradfield and village life there. 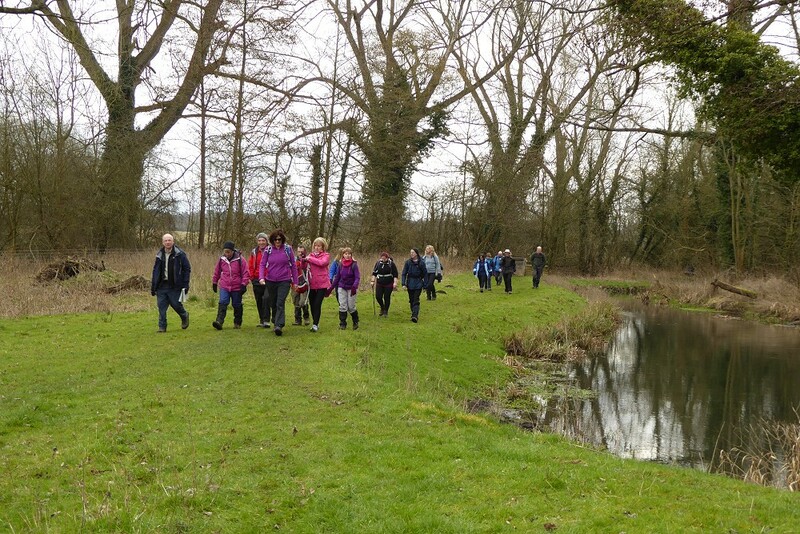 When pre-walking the route, we were hoping for lovely spring sunshine to enjoy our lunch stop on the banks of the River Pang. 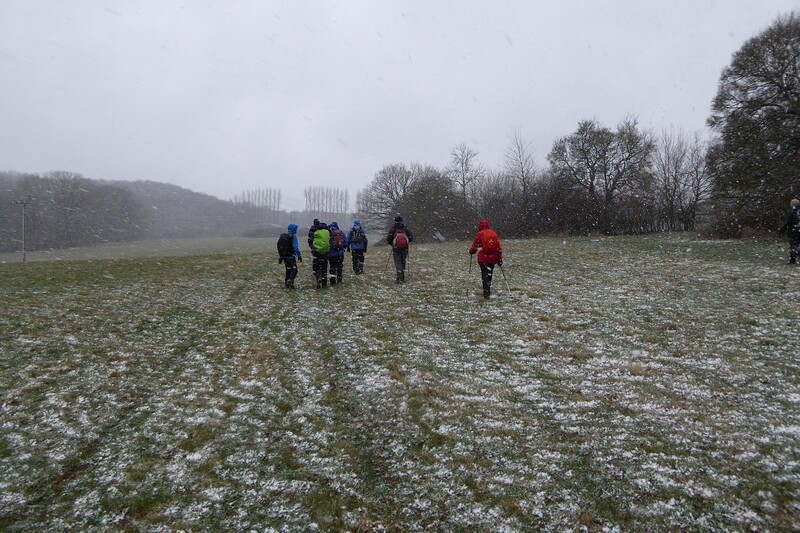 Instead, increasingly heavy snow was what we endured! Arriving back at Chapel Row. Passing a very muddy field of snowy bedraggled cattle, not unlike small highland cows, our next stop was for very welcome refreshments at the Old Boot Inn in Stanford Dingley where hot chocolate served in unusual jam jar shaped glass mugs was a very popular and enjoyable choice. As we sat thawing in front of a roaring open fire, the snow returned with a vengeance! From Stanford Dingley, a short but very white walk took us back to the muddy bridleway along which the walk had started, except this time the slippy ascent instead of descent definitely felt like a real workout! 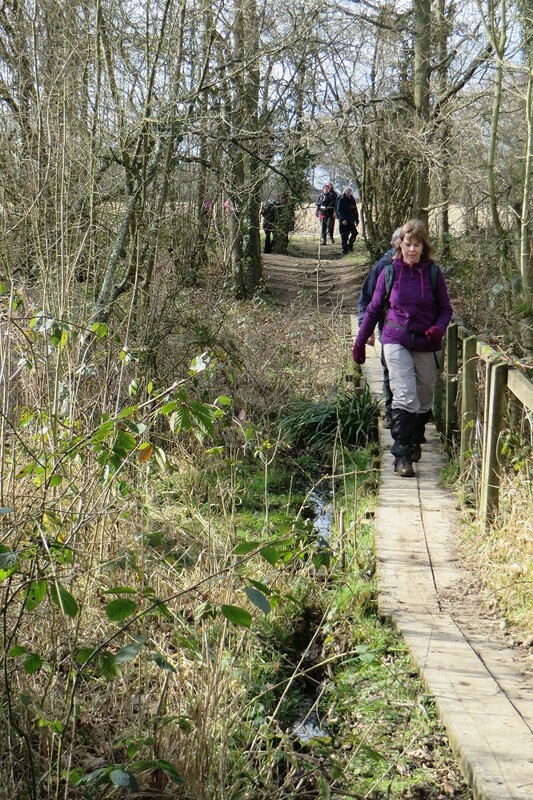 Thank you to Sue for leading the walk, for writing it up and for providing these photographs.